Dell's new thin client: jack of all trades, master of none? Behold the Dell Optiplex FX160: Yesterday Dell announced their "flex client" series of desktop devices. This is basically a super-small Optiplex-branded client based on Intel's Atom processor. Yesterday Dell announced their "flex client" series of desktop devices. This is basically a super-small Optiplex-branded client based on Intel's Atom processor. So what is it? A thin client? A desktop PC? A locked-down PC? A desktop appliance? Running Windows XP Embedded or embedded Linux, like a traditional thin client device. Is this something that people want? What scares me the most is the processor. Windows Vista is not exactly screaming fast to begin with. And that Atom processor Dell chose is benchmarking slower than a 900Mhz Celeron processor. Based on that, I can't possibly see anyone running Vista or XP (Embedded or local) on these things. Maybe when the dual-core Atoms come out next year this will be interesting. But if you ask me, what you have right now from Dell is yet another thin client. The other real downside to these is that Dell talks about a 3-year replacement cycle. So you get the cost and lifecycle of the PC, with the performance of a thin client. I like the overall idea, but I don't see it as being doable right now... I don't want to sacrifice the performance of my desktops (well at least not by that much) and yet I also don't want a thin client that runs $800 per seat. As for marketing a 3 year replacement cycle - that's just stupid. It distracts from the message they're trying to push and is probably the wrong kind of message you want to be portraying right now (with the current economic climate and all). I've been toying around with the idea of just buying $399 Asus EEE Netbooks and using them as thin-clients....when this "offline-VDI" thing actually takes off...just use that. I've been waiting for Dell to release a thin-client just because my company is all Dell on the server and desktop side...a thin client would just be one throat to choke, but I think they dropped the ball with this. I'd rather deep six a thin client then messing around with upgrading them, down grading them, etc. Whats also interesting is Dell claims they're the biggest WYSE reseller in the US, I'm sure by manufacturing their own thin-client, that has to put some kind of strain on that relationship. Suddenly, everyone thinks they can make a thin client. Where is the most important feature of this thin client? The management software. Slapping an standard OS on a small PC does not make a thin client. I don't know how Dell can charge so much for so little. Search the web for a real thin client with real management software. They do exist. A simple test is, does it allow you to remotely manage 1000+ thin clients? install software updates? make small changes without cloggin the network. Forget PXE for thin client management. Imagine 1000 thin clients clogging the network as they fetch their OS after a power outtage. It just doesn't scale. B. Vendors are so small or overseas and can't get on state discount contracts. C. Fly by night companies... the industry has never been stable. Dell is heavily working with Symantec Altiris for managing their bios and imaging. Altiris Deployment is one of the best products in the industry for this in my opinio. They are on most all states government contracts. You can even easily get them from cdwg. The person who mentioned the Vostro above for $500 is forgetting about the power and size diference. Mr Man you would set up a provision server at each location that has your gold image. Doesn't need to be much just a 2003 box powerful enough to hand your clients so they are not going over the wan. Software updates you change the gold image and push the updated gold image out to your branch servers. Next boot all machines are updated. It does scale if you really look into how PVS works. I didn't think so at first either but researching it I know better now. It may seem expensive at first but when you cost in the management benefits and travel to locations you quickly will see that it is indeed cost effective. I think the whole concept is wrong. Who actually cares that there are different Hardware models out in the field as long as we have a standard image for Desktop Devices and a standard image for Thin Clients from the same Vendor. To me itâs just Dell taking advantage of their mass production power and marketing a single model which they can mass produce at various different solution offerings. I canât see HP taking this approach who is the leader in this space after all. Expensive options also donât help this new offering from Dell. Iâve delivered heaps of ROI and TCO assessments over the years for FAT v Thin and the replacement lifecycle plays a key role in this so a 3-year replacement cycle doesnât help this in a FAT v Thin ROI or TCO. Also management of Thin Clients is extremely important and not been familiar with this model canât comment on the Management offering from Dell. Power consumption is great in this present world but what I really like about Thin Clients these days is the whole stateless thing which gives us options to deploy Thin Client down mines and to other challenging environments. Iâd give the whole concept a ânot sureâ and we will see how they fare in the Thin Client market. Jim Kenzig, I have a better idea than setting up a provision server at each location. Not setting one up. I'm sure your customer would agree. The point of thin clients is to minimize overal management (in personnel and hard/software), and if needing one additional server to maintain and update is necessary at each location, it is too much. If the point of thin clients is to save money, I don't see the benefit of using Virtual desktops. The reason is that in the end you get less user count for the same hardware investment with virtual desktops versus desktop publishing (RDP/ICA/etc.). Did I mention that you use more power on the server end too? The only reason good reasons I've heard for using virtual desktops is when you must use applications that don't work on RDP/ICA or you require a higher level of stability. I believe that weighed against cost and overall satisfaction, simple RDP/ICA is the best solution in 99% of the customer instances. I agree that schools and gov are different animals, but they hardly represent the majority of businesses, especially SMBs out there. OK I can't stand being dissed by "Oprah's human hankie"
Even if I try my best to take the high road, I am not going to let this one go. Mr. Man. I am not a VAR. I am a large customer of Citrix. I have been using their products for 14 years. And last time I looked there are more computers in use at government organizations than any other industry. 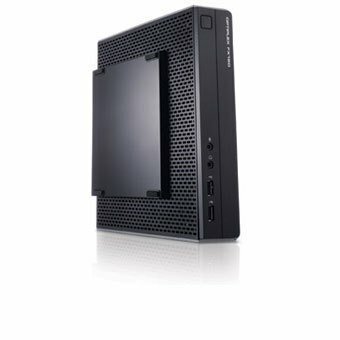 Thin clients are ideal for them whether they use TS er RDS or not. What makes PVS ideal is the idea that yeah you may have to have several single servers at locations with the image on it, you are only updating those servers and not thousands of machines or clients. If you have ever tried getting 4 versions of Java working on one machine or every plugin under the sun and multimedia you would learn very quickly that TS er RDS is NOT a viable solution. In this multimedia age people should wake up to this. There I am done. Interesting comments all around. The company I work for is already investing in PVS for DataCenters and as such have already invested in the server hardware at each of our sites. So the additional costs of deploying these servers specifically for these Dell Thin Clients is not there. I've had 2 different prototype units in my office over the past 2 months and to be honest, XPe runs rather well on the device. The unit which had a HDD and Windows Vista on it was slower than the XPe model but was by no means unworkable. I do agree the price is too high. Dell needed this device to come in around the same price as some of the HP's $300 - $450. I fear these devices are too good to be pure thin clients but not good enough to be desktops and in my opinion, there is no middle ground. Organizations either want desktops or thin clients, not something in between. from back in 2005 was a real hoot! But I really like the idea. Took a peek on fleabay just now and saw 10-paks of Wyse Wt1200LE's for ~$99.00! I am quite familiar with this unit. I like the curr price better than what Wyse was charging back then.